Aston Martin released this sketch of the Lagonda SUV. LONDON -- Aston Martin said the first vehicle from its all-electric Lagonda brand will be an SUV arriving in 2021. Aston is reviving Lagonda with the aim of breaking the duopoly held by Bentley and Rolls-Royce in the ultraluxury market. "The Lagonda SUV is the first of its kind: a spacious, high-performance 4x4 that successfully reconciles a love of technology, luxury and style," Aston Martin CEO Andy Palmer said in a statement. Aston is aiming to become one of the first manufacturers to use new solid-state batteries for its Lagonda models. It also intends to offer Level 4 autonomous driving abilities, although Palmer has said he doubts this level of autonomy will be available in 2021. Ashton first revealed its plans for Lagonda at the Geneva auto show in March with the Vision sedan concept, created to preview the design language for upcoming models. 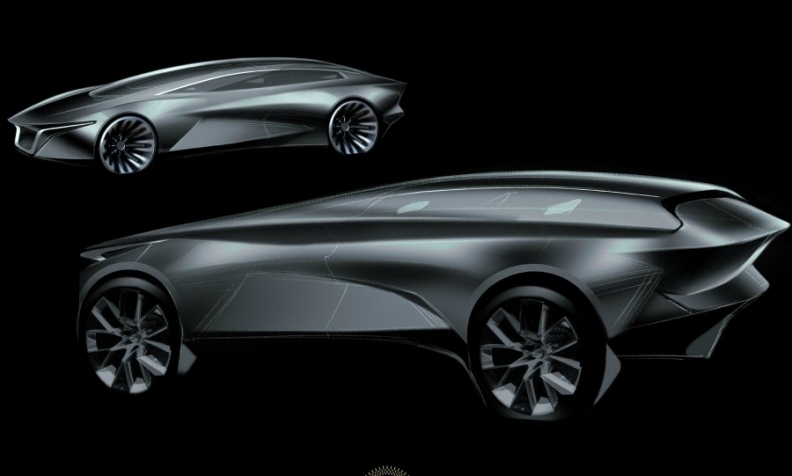 It also showed reduced-scale concepts of a Lagonda SUV and a coupe. The Lagonda Vision concept received a "stunning reaction" at the Geneva show, Palmer told Automotive News Europe in an interview. "We had to turn down people throwing money at us as deposits," he said. Interest was split roughly equally between existing Aston customers and newcomers to the brand. "They fall into the category of early adopters. I was particularly taken by the number of Chinese customers that have expressed an interest," he said. The Lagonda Vision concept provoked a reaction from Rolls-Royce CEO Torsten Mueller-Oetvoes, who told the Financial Times newspaper that Aston had "zero clue" about selling to ultra-high net worth individuals. Palmer replied that its research showed there was demand for ultraluxury cars among younger buyers in newer markets such as China. "Maybe their [Roll-Royce's] maths are better than my maths, but our maths said there's an interesting volume there." The Lagonda SUV will be a separate model to the Aston Martin-branded SUV launching next year. Palmer has said that the Aston SUV will be gasoline only. Aston Martin bought Lagonda in 1947 but stopped building Lagonda cars in 1958. The name has been used on just two Aston Martin designed production cars since.